Thursday was a momentous day for the precious metals sector with gold, GDX and other índices, and giant gold ETF, GLD all breaking out on impressive volume, and this development was all the more extraordinary because it happened when the broad stock market was crashing. This is viewed as a strong sign that instead of being dragged lower still by a crashing stock market, the precious metals sector will soar. Silver hasnt broken out yet, but it should soon follow suit. In recent weeks we have been wary that, despite highly favorable COTs and Hedgers charts and rotten sentiment indicators, etc,. a general asset liquidation might drag the precious metals sector even further down, but Thursday’s extraordinarily positive action by the sector serves to allay those fears. Of course, it’s not hard to see why the precious metals sector might do the opposite to what it did back in 2008 when the market crashed, and it nosedived too. There are two very big differences this time. One is that, before the 2008 crash, the precious metals sector was actually quite elevated. That is in marked contrast to now where it is beaten into the ground with sentiment in the basement  basically it is so unloved and neglected that the only way is up. The other big difference between now and 2008 is that while a major asset liquidation cycle will result in a flight to cash that could drive the dollar significantly higher, beyond that the longer-term outlook for the dollar is grim, with much of the rest of the world, tired of U.S. bullying in the form of sanctions, military threats, and now trade wars, and its unquestioning support of rogue states like Saudi Arabia and Israel, committed to freeing themselves from dollar hegemony  and plans in this direction are now well advanced, with countries like China and Russia having built up big gold reserves that can at some point be used to back their currencies, and workable substitutes for the SWIFT payments system at the trial run phase. Subjected to continuous provocation, China may at some point decide to go for the “nuclear option” and dump its huge Treasury hoard, sending the Treasury market reeling and interest rates skyrocketing, which will cause the US economy to buckle and implode  the U.S. appears to be overlooking that China has this power. Lets now review the charts to assess the significance of Thursday’s breakout. 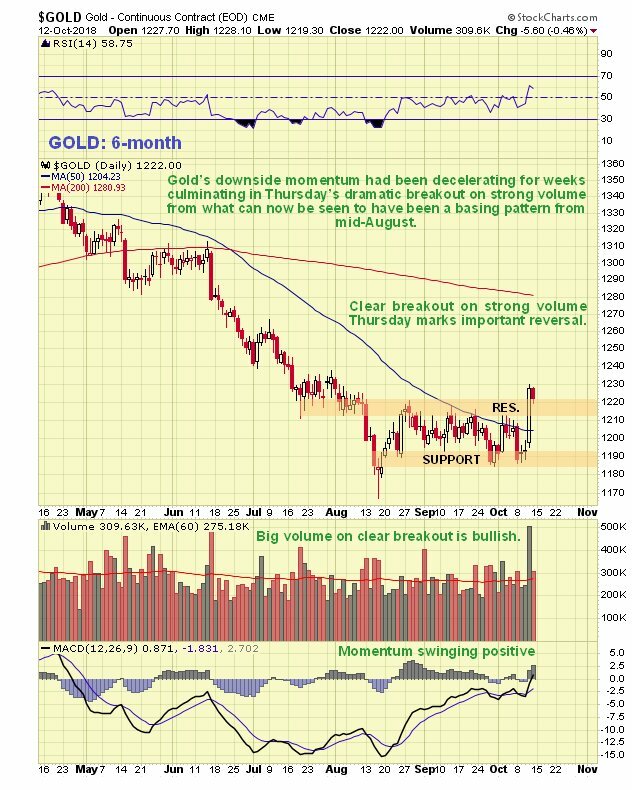 We start with gold where we see on its 6-month chart that it staged an impressive high-volume breakout from a rectangular trading range that formed following the low in mid-August. Right up until the breakout the pattern was ambiguous with the price being pressured by the falling 50-day moving average, so that it could easily have broken down again. Thus this big up day, with the price breaking clear above not just this average but also the resistance at the top of the pattern, was certainly an event of significance. The minor reaction on Friday is normal and provided us with an opportunity to pounce on the sector, having grasped the magnitude of Thursday’s action. 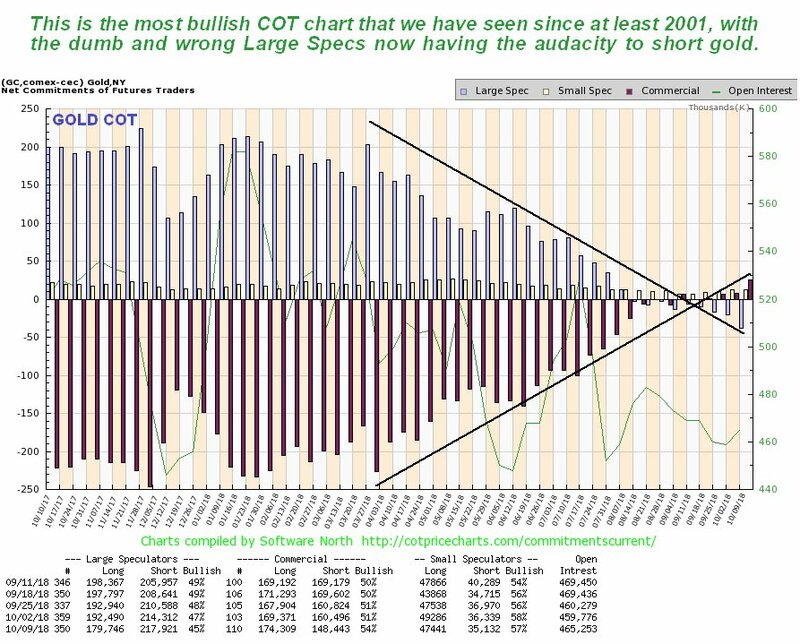 We dont need to dwell much on the latest COT chart for gold, beyond pointing out that it is the most bullish COT we have seen since 2001, with the dumb Large Specs actually shorting gold to a significant degree as of last Tuesday night. A chart like this means that gold has the potential for huge gains from here. 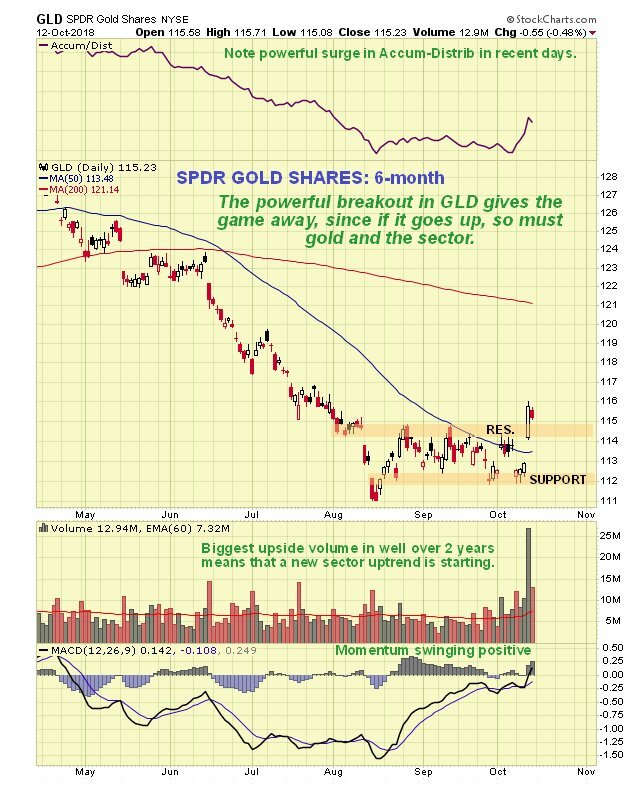 How does what is going on on golds chart fit into the larger picture? To get a handle on that we will now take an updated look at gold’s 10-year chart. You may recall that when gold crept up to the resistance at the top of the presumed giant base pattern earlier this year, we did not expect it to drop back again, or at least, not by as much as it did, but having dropped back more than we expected  and lambasted precious metal stocks in the process  it has arrived back in the broad zone of quite strong support shown. Now what appears to be going on is that it has just marked out another “shoulder” low of a complex Head-and-Shoulders bottom with multiple shoulders. 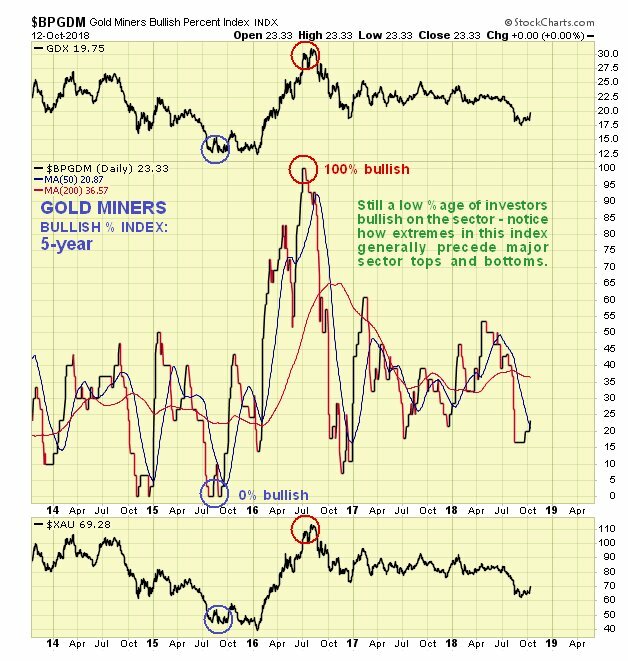 Certainly, the now powerfully bullish COTs and Hedgers charts strongly suggest that it isn’t going any lower, and it was heartening to see that it was not perturbed at all by the broad market cratering last week  on the contrary, it loved it! 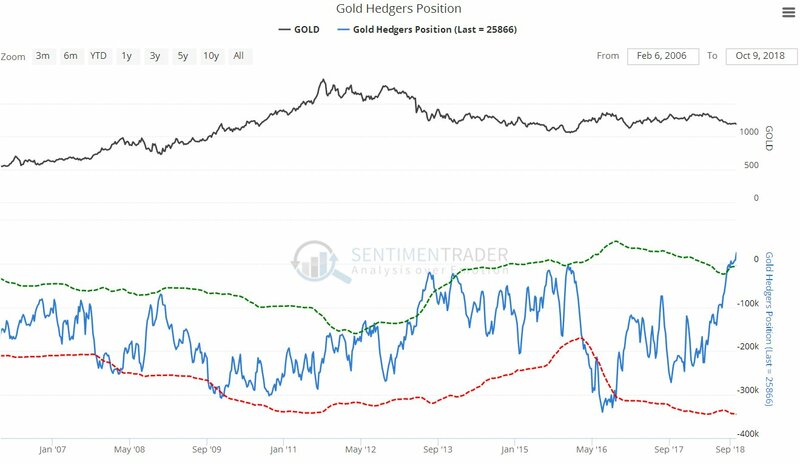 This is the strongest indication we could hope to see that this time, gold and the precious metal sector are going to go contra-cyclical and rally when the broad stock market drops, or during a general asset liquidation. 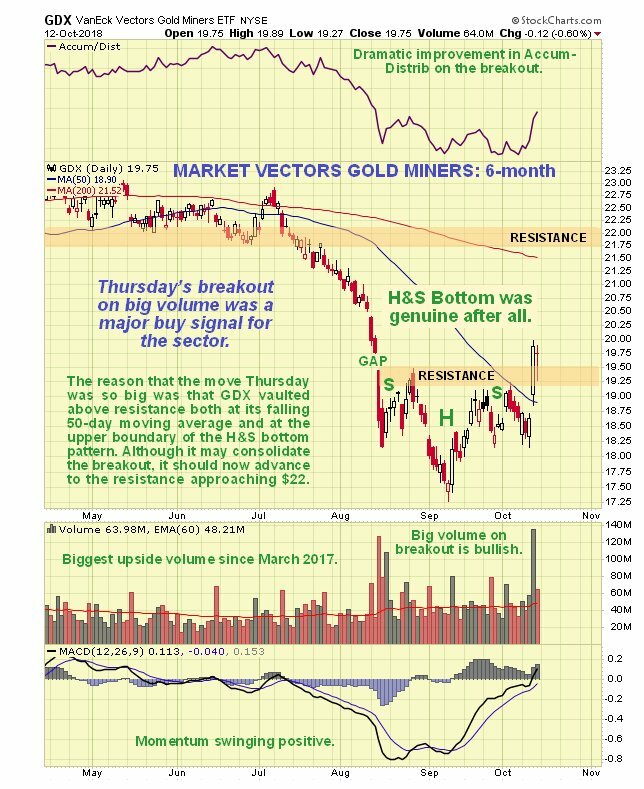 Now we come to the precious metal stocks’ big breakout on Thursday, which we will examine on the chart for GDX. 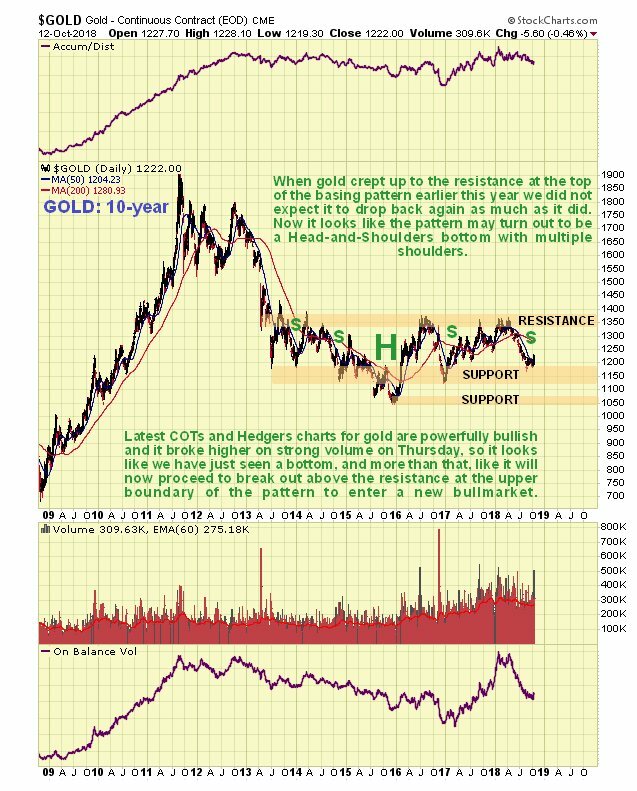 While we certainly recognized that the pattern forming in GDX was a potential Head-and-Shoulders bottom, we remained suspicious of it right up until the breakout for two reasons. One was the unfavorable volume pattern while it formed resulting in a weak accumulation line (which was also the case with gold and silver), and the other was the fear that precious metal stocks might be taken down by a crashing stock market  but happily the opposite seemed to be the case, with precious metal stocks seemingly thriving on the general mayhem  and why not?  as the most unloved sector around for years it’s time for a change of fortune. In any event, as you can see, what must have been an internal improvement ahead of the breakout was heavily camouflaged, which was why we didnt buy ahead of it, but the big volume on this breakout, especially in GLD, means that it should be “the real deal” and not a deceptive pop, especially as it happened when the broad market tanked. A very important point for would be investors in the sector to grasp is that you shouldn’t be put off by missing Thursday’s breakout and having to pay higher prices for most larger gold stocks. They may in some cases be about 5% higher in price than they were last Tuesday or Wednesday, but that is NOTHING compared to the massive gains that these stocks are capable of making from here  don’t forget that this sector has been ground into the dirt by a 7-year bear market and has huge ground to make up, and the great news is that more the broad stock market gets clobbered, the higher the precious metals sector will go. Buyers now have the assurance of knowing not just that the sector has broken out, but also that it has the capacity to rally strongly when the rest of the market is cratering, as it has just demonstrated.